The Oasis is a small place on the corner of Seventh Ave and William Penn Place. I believe they are best known for their coffees, but while in search of something new for lunch yesterday, I remember seeing a special on their board which peaked my interest. I wanted lunch that I could get to go and frankly wasn’t in the mood for any of my usual joints. Once inside, I felt very relaxed and wish I’d left myself time to stay and eat inside. My order was the special of the day, which was a Grilled Steak Fajita Salad. It included drink, which I got a homemade lemonade. The lemonade wasn’t too sweet either. 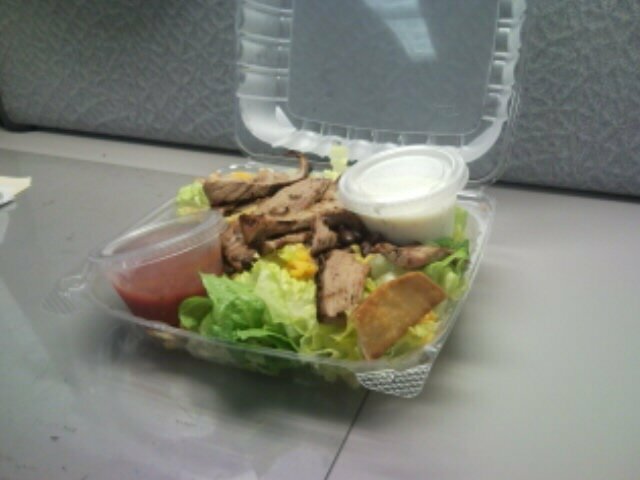 The salad had lots of meat on it and included some pita chips which added some fajita-ish crunch. Also inside, they had some tasty muffins, a wide coffee selection and claim to offer ice cream – which may be a downtown rarity. When I grabbed the menu to see what else they offered, I was advised that the specials change daily and are not printed in the menu. I guess that just means I’ll have to pay attention to the little chalkboard outside the restaurant for what new ideas they are thinking up. If nothing else, I’ll need to stop by for a summertime ice cream treat. P.S. Urbanspoon didn’t have The Oasis in their directory so I added it. More people should stop by and vote on if they like it.